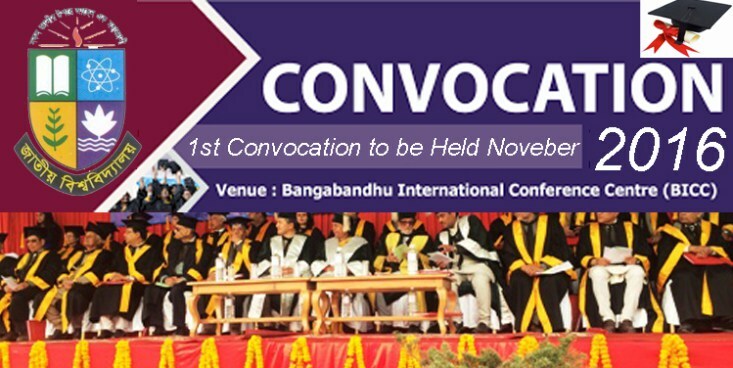 The first convocation of National University will be held on November 2016. Those who obtained degree from any colleges under National University will be able to attend in the convocation. To attend in the convocation, one will have to register for National University Alumni. Degree pass exam 1998-2012, Honours Final exam2002-2012, Masters final exam 2002-2012, BBA 2007-2012, MBA 2003-2012, Bed honours 2007-2012, Med 2006-2012, BSc honours in Computer Science 2008-2012, BFA (honours) 2007-2012 , BFA (pass) 2009-2012, ECE 2010-2011, LLB final 2003-2012, MSc 2003-2010. The fee of registration Tk2500 can be paid through Sonali Bank online service, DBBL mobile banking, and credit or debit card. The last date of registration is 8th June, 2016.